Heavy duty butyl diaphragm of the Amtrol WX-202XL well pressure tank is the thickest in the industry and features seamless construction for uniform strength and flexibility. 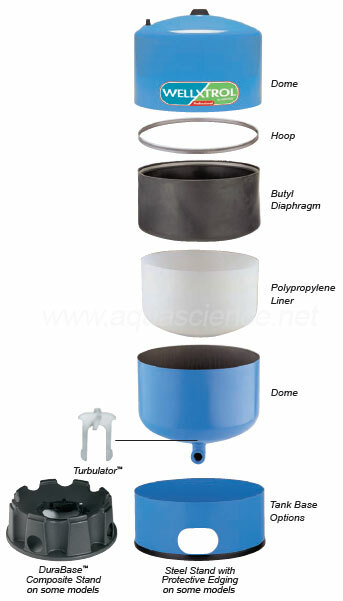 It conforms exactly to the shell configuration without stretching, creasing, or forming bubbles or corners that could trap water or sediment. Welded air valve is permanently attached rather than mechanically threaded to prevent loss of air pressure and to minimize stress on the well's pump system. It also carries a tamper-evident warning label. Exclusive welding process eliminates interior rough spots and sharp edges that can damage the diaphragm and liner. Each finished tank is pressure tested for safety and pre-pressurized to the most common pump cut-in pressure; Exterior appliance-like finish looks attractive while protecting the tank from the elements. Secures diaphragm and liner for added strength and reliability. Meets stringent FDA requirements for potable water. I found Keith Specialty through a youtube video and was glad I did. I needed a new pressure tank, and found one on keithspecialty.com for a fantastic price. Shipping was very fast, and I highly recommend this company to anyone in the market. I prefer dealing with small businesses whenever possible.